So bored with the usual peanut butter sandwiches for breakfast! So just wanted to do something different this morning. 1. Beat eggs, milk and salt together. 2. Trim and butter the bread and put butter side down into muffin tray. You can use a pretty cookie cutter if you have time to make the bread basket prettier. If don't have muffin tray use anything oven proof bowls. 3. Pour egg mixture into bread baskets and drop in a small piece of cheese. 4. Bake for 10 mins until egg mixture is cooked but still nice and wobbly! This is a very impromptu dish using ingredients available in my fridge. You can jazz it up using more fancy cheese , wrap bacon or ham on the outside of the bread basket before baking. Or add some thyme into the egg mixture. But just as it is was delicious too. 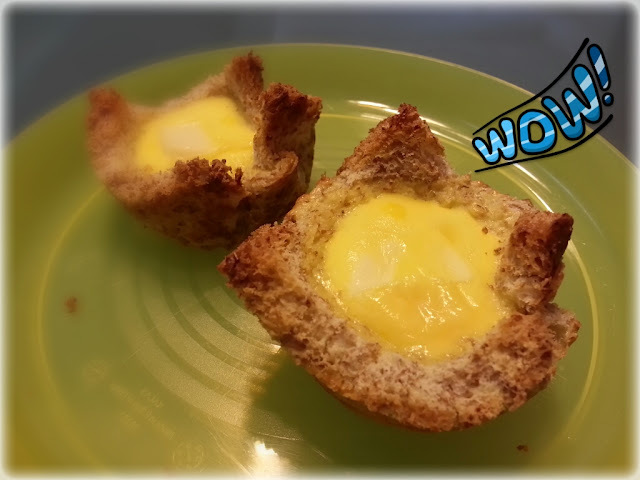 Kind of like a simple cheesy egg tart. Will definitely try it again.